Your Greene County Public Library card gives you access to more than 75 million books, movies, CDs, and other materials. We own over 600,000 items locally, and our interlibrary loan service lets you borrow millions more. But what actually happens when you request an item through interlibrary loan? Not surprisingly, the process is computer-powered. Our interlibrary loan partnerships each have servers that route requests to a library that owns the item. Those libraries send books, DVDs, CDs, and other materials to regional sorting centers, which in turn send them to our library. Once the items arrive, our Resource Sharing department takes over. 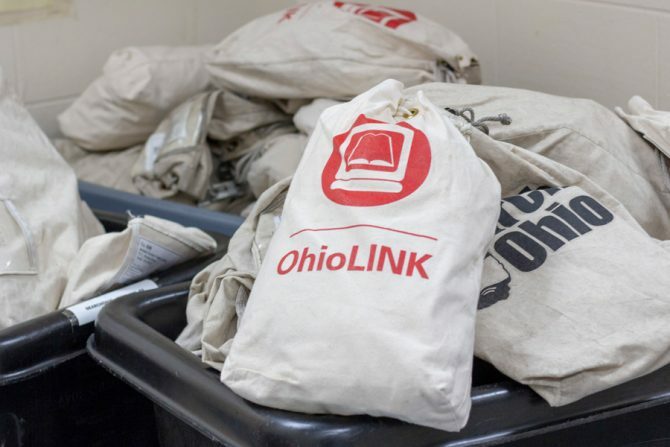 They process more than 60 bags of books and other materials each day. Resource Sharing Manager Amy and her staff of aides sort the requests that come in and send each one to the appropriate library location for patrons to pick up. Resource Sharing also creates temporary records in our system for each interlibrary loan item. These records are one of the most important steps in the interlibrary loan process. Without them, you couldn’t check your interlibrary loan materials out, renew them, or receive due-date reminders.